A little or a lot? Or how much quilting for this quilt? How much threadwork does this quilt need? Celebrating 25 years with this guy on Wednesday September 27th I love him! There’s a reason why the word “It’s your quilt, it’s your rules” frequently exits my lips – this part – like so much of quilting – is all about you. You get to pick. You get to choose the lime green and pair it with the deep gray. You get to pick what weight, and color thread. What is the end purpose of the quilt? What batting will be used? What thread(s) will be used? First – no muslin. There are two different weights here because I didn’t know any better in that moment. The cream is where the gray will be. Not only the gray background, the rest of the colors will be changing as well. My use, and understanding of color has changed. Second – it’ll be bigger. It covers our queen sized bed, but not with us under it. I’m not a fan of fighting for the covers, are you? Third – it will be all machine quilted, a bit more consistently across the surface. This is comes from the years of experience I now have. This will reflect where I am as a quilter now, and this is my choice. Fourth – batting – most likely wool, or silk. because I like how they show off the quilting. 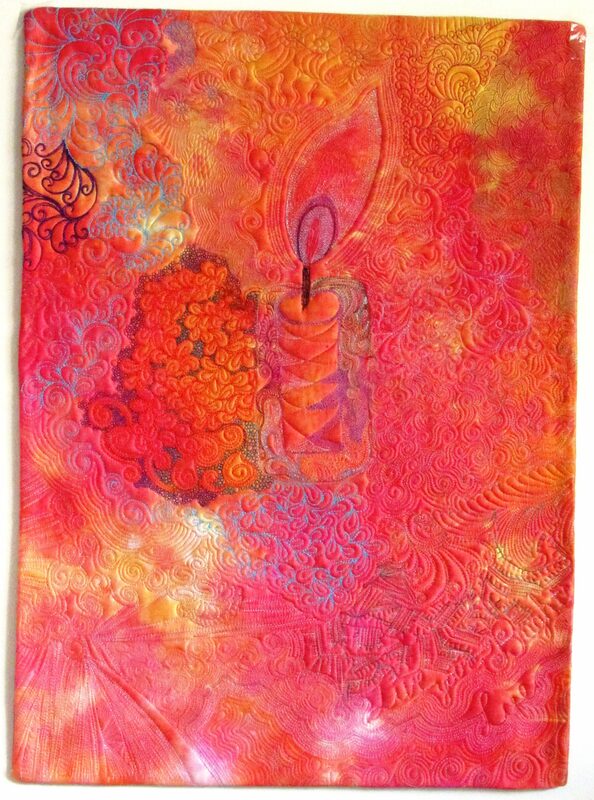 When I started quilting this I used a dense cotton, I liked it at the time. However my experience now brought other battings into my quilting world. It’s been exciting exploring what they do. In an upcoming post I’ll share the battings I use and why. Fifth – thread – it used to be all cotton. Now there are so many threads – cotton, wool, polyester, silk that are worth a look. Then there’s weight. Oh dear me I’m getting excited thinking about the possibilities! So this is a bed quilt, with wool batting. Depending on the batting I might be able to quilt 4 – 8″ apart. So that will, in some ways, determine how much quilting is stitched over the surface of the quilt. Now I’ll talk about whole cloth, and art quilts a little later on. Stay tuned! PS there’s still time to enter a quilt in the Connections Quilt Festival I’m filling out the paperwork for 2 later this morning! I like using cotton thread also. One caution. I hand quilted a 60″x80″ top of 1-1/2″ squares one inch apart using Hobbs wool batting. It is a quilt I use regularly. I have washed it several times and found that it shiinks each time. My sister also had this experience with wool. If you will be washing this quilt frequently, please consider Hobbs 80%cotton 20% polyester. I have a queen size quilt of four inch squares where I used cotton batt and another one with 80/20. Both have been washed often and have worn the use very well. Wool will shrink if it’s dried in the dryer on a higher heat. Use a lower setting or let it dry on a clothes line. This is a very good suggestion. Yes. When I wash the wool quilt I lay it out across chairs to dry. It has not been in the dryer. The other two quilts have been put in the dryer. And you know this is always the hardest part of finishing a quilt!!! I’m in that spot right now…just quilting an art quilt, which is really hard to quilt! HA Thanks…your work i wonderful! This is always the hardest part! Teri, This is one of the best posts I have read of yours. So much information and so much to take into consideration. I learn something new every time I read you posts. I love Cotton but only use it for quilts that are meant for kids. Other than that I use Sulky Polylite. As for batting I will never use Bamboo as it fuzzes up my needle too much. I love Hobbs 80/20 or Silk Batting as Silk does show quilting nicely. Thank you so much for this post as I have just recently gotten 7 quilts for customer to work on and my quilting business has now taken off. Information like this does help those in the industry to succeed. See you at Connections I have a surprise for you. thanks for taking the time to comment Sally. You’ve given me some ideas for blogging down the road.